Virginia Woolf by George Charles Beresford, 1902 (Wikimedia Commons) British author Virginia Woolf was a prominent member of the avant-garde, intellectual Bloomsbury Circle in northern London from the years directly preceding World War I until her suicide in 1941. Woolf is best known for her novels, which represent the peak of British modernist “stream-of-consciousness” style, characterized by the representation of characters’ inner thoughts, a focus on everyday action, and the pervasive instability or unreliability of narration. In her own time, Woolf was also well-known for her writings promoting liberal politics, particularly the nascent feminist movement. Her non-fiction, including A Room of One’s Own (1925) and the anti-fascist tract Three Guineas (1938), is central to the “first wave” feminist canon. Though Woolf’s adult writing often railed against her parents’ stern, pompous Victorian generation, her future career was certainly aided by her birth, in 1882, into a prominent, upper-middle-class London literary family. Woolf’s father, Leslie Stephen, was the well-known editor of the first Dictionary of National Biography, a pronounced atheist and overbearing patriarch. After the death of his first wife (the daughter of the famous novelist W. M. Thackeray) and the institutionalization of their schizophrenic daughter, Stephen married Woolf’s mother, Julia Prinsep Jackson, who brought along three children from her previous marriage. Woolf later alleged that the two older boys, George and Gerald Duckworth, had sexually abused her during her adolescence, yet she looked up to their sister, Stella, as a role-model and mother-figure. Julia and Leslie Stephen went on to have four children together: Vanessa, Thoby, Adeline (called by her middle name, Virginia), and Adrian. From childhood, Vanessa and Virginia were intimate, competitive, and rebellious; they decided early on that Vanessa would become a painter and Virginia a writer. Though Woolf’s early life included much happiness, her adolescence was marked by traumatic loss, first of her mother when she was 13, then of Stella two years later, then of her father and idolized brother Thoby in the following decade. Woolf’s mother’s death precipitated a major mental breakdown, the first of several throughout her life, leaving her debilitated for months, confined to bed and given barbituates to curb suicidal impulses. According to the psychiatry of her day, Woolf’s depression and hallucination was diagnosed as “neurasthenic,” for which doctors prescribed large amounts of rest and prohibited exercise or mental exertions such as reading and writing. There is no consensus as to Woolf’s actual mental illness, but many now believe it to have been some form of bipolar disorder. Virginia Woolf by Roger Fry, 1917. 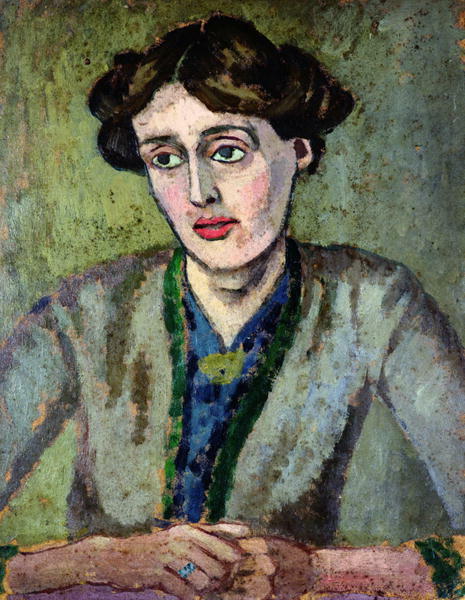 (Wikimedia Commons) Along with Clive Bell, the artist and critic Roger Fry’s aesthetic ideas influenced Woolf’s works. Among Woolf’s acquaintances in Bloomsbury was the Jewish writer Leonard Woolf, whom she married in 1912. Beginning with Woolf’s suicidal breakdown in 1914, while editing her first novel, Leonard became her main lifeline, supporting her through illness and freely accepting her later attraction to women and affairs with them. With Leonard’s help, Woolf tooka keen interest in publication and the establishment of the Hogarth Press, which put out small-run first editions of many major modernist works, including Eliot’s The Waste Land and Freud’s translated writings. Printing provided a distraction from Woolf’s incipient literary career, which took flight with several short story collections and the novels The Voyage Out (1915) and Night and Day (1919). Her breakthrough came in 1922 with Jacob’s Room, which displays the beginnings of her characteristic stream-of-consciousness style, a mode which is then refined and mastered in her great novels of the 1920s, Mrs. Dalloway (1925) and To the Lighthouse (1927). All three works play upon the boundaries of time, ranging from Mrs. Dalloway’s focus on single day to To the Lighthouse’s punctuation of two days by a bracketed ten-year interval. Though To the Lighthouse places World War I at its background (exploding forward through the death of Andrew Ramsay), both Jacob’s Room and Mrs. Dalloway explore the effects of the war more comprehensively, representing both its immediate destruction and its long-term repercussions. Woolf’s later novels reconceptualize the style of her earliest pieces in new themes and formats. Orlando: A Biography (1928) takes up Leslie Stephen’s biographical mode in its depiction of Orlando, a writer who lives from Elizabethan times to the present, encountering various famous figures, and, in a notorious twist, turning from a man to a woman halfway through the novel. Woolf dedicated Orlando to Vita Sackville-West, her close friend, lover, and the model for Orlando’s character. Woolf’s financial success with Orlando allowed her to experiment further in her subsequent novels: The Waves (1931), Flush: A Biography (1933, the story of Elizabeth Barrett Browning’s pet spaniel), The Years (a 1937 international best-seller), and Between the Acts (published posthumously in 1941). Though all take on Woolf’s perennial themes addressing the challenges of human connection, they range from the solemn (The Waves) to the playful (Flush). The last, Between the Acts, evinces Woolf’s mounting concern at the threat of a Second World War through its depiction of the impasses within stream-of-consciousness and interpersonal connection. Ultimately, the strain of the editing this novel, the destruction and disruption of the Blitz, the loss of several close friends, and the threatened onset of mental illness led Woolf to drown herself in the Ouse River on 28 March 1941. By that time, she was a well-known public figure, a best-selling and widely translated author, and was much mourned around the world. Hermione Lee, Virginia Woolf, New York: Vintage, 1996.